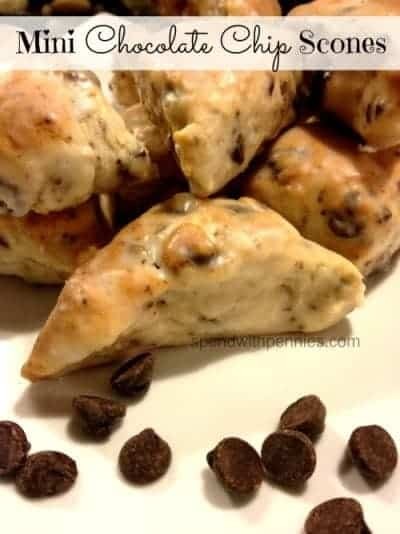 These yummy Mini Chocolate Chip Scones are perfect with coffee or for breakfast! The delicious glaze not only tastes great but helps to keep them fresh! I am not a scone lover. I have never been and I didn’t think I ever would be… until I met these scones. My 15 year old daughter is a tremendous baker! She’s been baking for years and is truly talented in the kitchen. As much as I would like to take credit for the bundles of yummy… they were made by my daughter! (Thanks sweetie, they are amazing just like you). 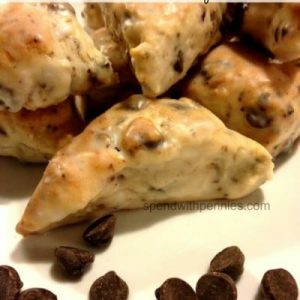 These sweet and simple melt in your mouth scones are so amazing with a coffee or even as dessert! I’m telling you, I’m hooked! I am not a scone lover. I never have been and I didn’t think I ever would be… until I met these scones. Combine dry ingredients in a bowl. Using a pastry cutter or fork, cut in the butter until the mixture is crumbly. Add chocolate chips & mix. Flour your surface very well and roll/pat the dough into an 8″x8″ square. Using a pizza cutter (or a knife) cut the dough into 2″ squares (16 squares) and then cut each square diagonally. Bake on parchment paper for 18 to 20 minutes, or until they’re golden brown. Stir together sugar, water, and vanilla. This original version of this recipe was found at King Arthur Flour! I made these yesterday and they are fabulous I highly recommend and they are easy not much different from making biscuits thanks for the great share. Wow, do these look good. They would be perfect with coffee, which I drink WAY too much of. Lovely! Now that I’m gluten-free, scones are one of those treats I miss. I’ll have to figure out how to make it gf. I need one of these scones to go with my coffee. Your recipe is fabulous and thank you so much for sharing with Full Plate Thursday. Have a great weekend and come back soon! I haven’t made scones before, but recipes like this one make me want to try. I’d be thrilled if you’d link up at this week’s Off the Hook! I love scones but agree a lot of them are dry and crumbly. I’m pinning this recipe and will definitely try it soon. Thanks for sharing! I generally find scones to be dry which is why I’ve never been a fan! I find these ones moist and tender, let me know how they work out for you! Those look delicious! I also didn’t like scones for a long time, it was chocolate chip scones that changed my mind too!